Thanks to the Iowa West Foundation’s unique public art initiative, Council Bluffs is home to an outstanding public art collection created by artists who have made their mark worldwide since 2004. Tom Hanafan River’s Edge Park is home to two pieces of the Iowa West Public Art collection. Designed by internationally-recognized artist Mark di Suvero, “Big Mo” stands on three legs and has two moving pieces on top that rotate in opposite directions. Di Suvero, 81, is often referred to as a pioneer of steel. His works can be found in more than 50 cities throughout the world and in more than 100 museums and public collections, including the Metropolitan Museum of Art, the Museum of Modern Art and the National Gallery of Art. Rays by Dan Corson is a unique and interactive light display on the Great Lawn of Tom Hanafan River’s Edge Park. 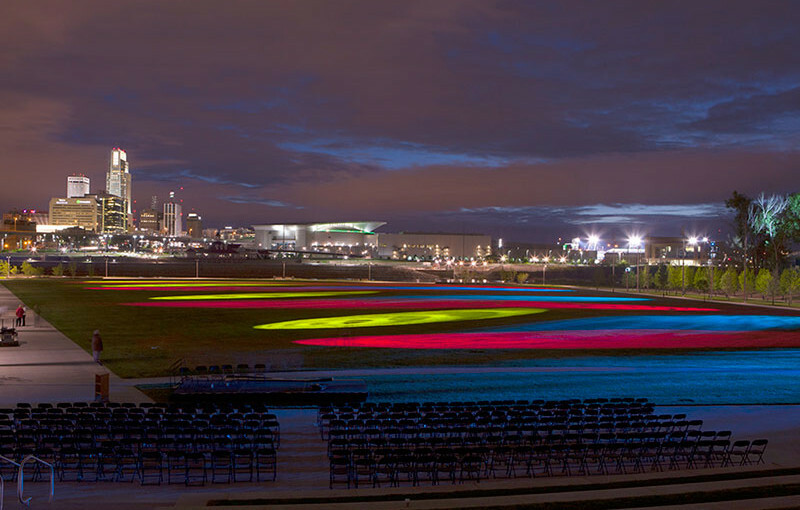 This eight-minute interactive lighting environment uses the five-acre Great Lawn as a canvas. Utilizing powerful dynamic and robotic lighting fixtures, the lawn is activated every half hour after sunset. In addition to the choreographed sequences, there is a complex interactive lighting component that will track and “play” with people through a series of simple intuitive games. The motions of the people on the lawn will control the lighting in some instances, and in others it will track them similar to follow spots at an ice skating event.